It's been a couple of years since there has been a StinkyDog Beads giveaway. Since then, Kitty Bozzini has expanded her inventory to include many gorgeous items. She started out as a lampwork artisan but now offers unique one of a kind findings as well as the uncommon ones. She has an uncanny eye for the sort of sumptuous beads, charms, clasps that can add that something extra to any jewelry design. It was incredibly hard to pick my favorites to feature here! Her animal clasps were wonderful. She also stocks Super New Glue (not the usual Super Glue which can become brittle with time) which I have found to be excellent for the Regaliz style bracelets. It's the only glue I use for that kind of application. There are many types of cast metal beads. The sea theme ones are lovely. What's more, she also offers some with different finishes. Kitty also caters to those who love the beautiful patina colors but not so much the patination process. Sea glass is getting harder to find. So if you just like the look of frosted glass, check out the faux sea glass which Kitty calls cultured recycled "sea glass". The sea horse ones are so cool! Great selection of Czech beads, too! Kitty also supports other handmade artisans. These lovely ceramic bird beads are by Gaea Cannaday. The ethnic cotton cords are unusual and with lovely bright colors. Some of the more unusual items in the store are real preserved wood beads. Have a look around this wonderful store. StinkyDog Beads has a number of incentives including 15% off your first order and newsletter signup. There is also a rewards program as well as a discount incentive if you share a design. If you'd like to win a $35 Gift Certificate from StinkyDog Beads, please make a comment below. Make sure you leave contact info below if you do not have an online shop or blog. It ends in a week's time at 6 pm EST Monday, April 18 , 2016 . I will pick the winner randomly and announce the results as soon as possible after. So be sure to leave a contact email if you don't have an online link or make sure you come back and check! Otherwise I will redraw in a week. Good luck! What cool looking beads, I agree I love the seahorses. Hi, Pearl, Love Stinky Dog Beads. The green and blue patinaed items are beautiful. I've bought them before and will again (hate that pesky exchange rate!). All quality items from SDB. Funny shop name, fun products. I love the unique assortment of beads & products at Stinky Dog (but I'm glad I'm nowhere near the source of the stink!). I am especially intrigued by the wood beads, the cultured sea glass, & the patinated metal beads & findings. Pearl, as always, thanks for all your hard work on behalf of the beading community. I always enjoy your blog & FB posts. Thanks for the chance to win - I've heard so many great things about StinkyDog beads. i would love a chance to get to know this artist's work! LOL i love the name of her business! Beautiful pieces, would love to win them! Blog follower and subscriber, I can be reached at retro-grrl@hotmail.com. Hi, I would love to win those! Thanks for the opportunity! Very generous! That would be helpful my jewelry hobby. Thank you. I love getting the blog posts in my email how very exciting!! I'm checking out the StinkyDog Beads site as of right now and I'm seeing some lovely stuff!! How wonderful to find new and interesting materials to work with! This is one site I will check out. Another wonderful giveaway ! If I win, it will be VERY difficult to make a choice ! Thank you for showing us these marvels ! this is an address I will keep ! What awesome beads!! I'm heading there now to check it out. I'm a blog follower, Twitter follower and Pinterest follower. Stinky dog is just what I have been. Looking for. Please enter me in give away. These are awesome beads! I would love to win the gift certificate!!! Wow! I had never seen this shop before and love it. I've never seen Stinky Dog beads before! What unusual and beautiful beads! I would SO love to win this! 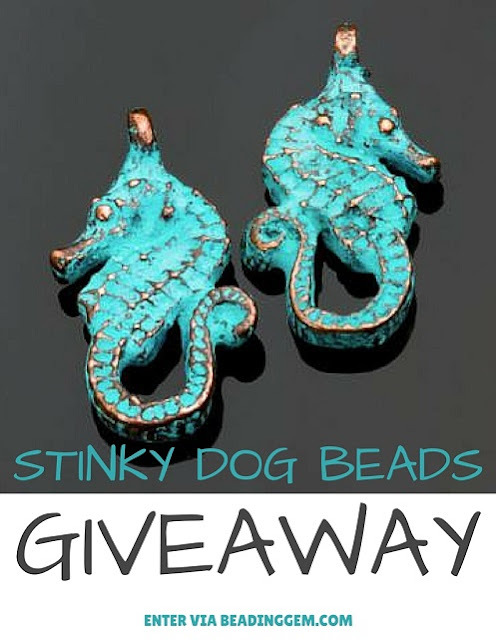 I am SO PSYCHED that you are doing another Stinky Dog Beads giveaway!! I was introduced to Stinky Dog through your first giveaway for them a couple of years ago, and I have been a loyal fan ever since. In addition to loving their WONDERFUL shop name (as I, myself, have my own pack of "Stinky Dogs", and who doesn't love shopping from a store named "Stinky Dog"?! ), they always carry an amazing supply of artisan beads and components that you simply can't find anywhere else. They carry some of the most exquisite Czech glass beads, and their Greek cast metal components are awesome. However, some of the coolest things I have found at Stinky Dog are those wonderful little figural clasps and components they always have. Simply put, Stinky Dog beads ROCKS!! I just adore the metal beads which would look fabulous on my horsehair braided bracelets. Stunning! Please enter me to win these gorgeous beads! I suspect you will get a record number of comments for this giveaway, it looks so wonderful. Once again Pearl this looks like an amazing give away. Awesome and unusual things offered at Stinkydog Beads, that in itself is a rarity. I subscribe to blog, email and facebook. Thank you for the chance. Am a blog subscriber and FB follower. Thanks for the chance Pearl! Thank you for introducing me to this lovely, fun shop! OMG, I love the dog bracelet! I have never saw or heard of Stinky Dog before, what an awesome find. Thank you so much for sharing this info and yes what an awesome giveaway!! Love to win this one. I always love your emails there is always so much neat information and news. These beads are awesome!! Already trying to design around them!! I'm in love with so many of these. Shared on fb, pinned, g+, email,and tweeted. Thank you Pearl for such a lovely article. We also appreciate all of the wonderful comments. She has some great clasp designs and a real imagination for perspective! Thanks for introducing me to someone new! I have ordered from Stinky Dog before, and I love your cool selection of beads! Thank you for the chance to win! Everything you carry is so nice and different. Quality is great. I see you have added new items...really like them. Thank you for a chance to win! These look like so much fun! What a great giveaway. Yeah Pearl, You found more great stuff for us to win. These are awesome and I would love to have some of these cool beads. I've often drooled over the stuff in her shop. Yummy choices!! Thanks for the opportunity. I just had to go the website and check out what's on offer after looking at what you chose Pearl. I have to tell you - I started to get that feeling in my stomach - where you think you are going to faint because you are going to do something really drastic - like max out your credit card!!!! What an incredible and unusual selection. Right up my alley! I do not like using what everyone else uses. I prefer to make things that look different and stand out as unique. Stinky Dog Beads certainly fits that bill from beads to stringing to clasps - all of it. I don't care if Lady Luck doesn't shine on me again this time - I'm in there. Wish me luck. If I don't come out in a couple of days - send in help! You have so many beautiful and inspiring items! On Etsy as HerARTofStone ... HerARTofStone@yahoo.com ... and thanks to Lorelei Eurto for posting this on Facebook ... Thanks! Mary Ann. I would love to win such an awesome prize! Meg at cherryonion dot com. What a collection of varied and beautiful beads. I love the idea of the cultured recycled "sea glass." I woulld love to win this contest and have a chance at winning some of these beautiful beads. awesome giveaway! ty! i am blog subscriber, follower,and do shout outs! I'm uniquely qualified to win this fabulous prize as I'm certainly the owner of the world's two stinkiest dogs. I'm not proud of that fact but these Boston terriers keep the room fragrance industry in business. I follow your blog daily and have shopped at Stinky Dog many times for their unique treasures. Tootsie and Tugg hope I win, as do I. Love the name of this company because I have a stinky dog too! Horse head clasp is my favourite! Hi Pearl! Thanks for hosting this giveaway! Stinky Dog Beads has such a great selection of items. I sure would love to win. Love it, would like to make jewelry with these beads. I have never heard of this shop before. They do have some very unusual beads and I agree with you the seahorses are something else. I love sea glass so those beads are gorgeous. I love the seahorse---love anything to do with oceans and water. I actually found a couple of pieces of sea glass last summer at the Outer Banks. Thanks for the chance to win. LOVE the horse clasp! Would love to win! I am a blog follower. Love your posts. Wow! What unique clasps. I have a few pieces of finished jewelry on my work bench waiting for a special clasp. Thanks for the opportunity for this giveaway! I love SDB. Great shop! This is an exciting giveaway! Thank you! I am always looking for new and unique beads and this definitely looks like both! What an awesome giveaway. Thanks for the chance to win. These beads are wonderful ! I would love to win some. OH STINKY DOG PICK ME! Thanks for a chance to win - those StinkyDog beads are beautiful! I get your daily emails - keep up the good work. The name cracks me up! I love the unusual when it comes to beads and links. Thanks for the chance to change things up. Fan and follower forever. Love these beads. Would love to win them. Since I also raise, train and show dogs, how could I resist entering a contest for something called StinkyDog beads? Besides they are also really pretty. I like "Sea Glass". They have a nice selection of beads. Whoo, hoo...I love Stinky Dog Beads! Stumbled across your site by happy a happy accident. Bookmarked it immediately... Love seahorses. great giveaway! love the recycled "seaglass" pieces. Love Stinky Dog, such gorgeous beads.I am a blog subscriber. I'm a fan of the shop because we have the same taste! Thanks for Stinky Dog for the offer and Pearl for making it possible. I'm a long time subscriber. Thanks for the intro to this store. What gorgeous beads. First time to see StinkyDogBeads... but not my last, I love them all, the silk ribbons are wonderful and the sea theme beads want to come live with me!!!. Sure Do want to win. Thanks for making this contest giveaway possible Pearl. Subscriber and follower. Kitty always has such beautiful beads! I'm a blog subscriber too! I am the lucky recipient of the last Stinky Dog giveaway. I figure I will press my luck and go for 2. I am a blog subscriber. The Black Heart Walnut Wood Beads are very neat looking. I have never seen anything like them. Love Stinky Dog. Wonderful selection of products. Follow you and Stinky Dog on FB. I love Stinky Dog beads and I actually have proof. All you have to do is look at my credit card bills! Love your beads and supplies. Great choices to choose from. I'm a newbie and extremely excited about finding you guys! So much in common with the designer .. I Love the oceanic themes and have a passion for birds and ceramic beads so that's a must! I love the Aztec rope which Would look great with my Scottish designs being a Scot I love the sea! And to top off all the common loves .. I too have a stinky dog .. My boxer bungle the love of my life! Cool shop with fun beads! Will be shopping there even if I'm not fortunate to win. Thanks for the contest Pearl! WOW, WOW, WOW, WOW, WOW!! What beautiful beads and findings. I can see why it was difficult to pick the featured elements. I've just started working with the patina-type beads and love them. It's an Old World look for New World applications. And those animal closures are so cool (as a Celt myself, I really love seeing these types of findings on the market). What a great opportunity for a giveaway. Thanks for the chance; good luck all! Always love these opportunities. Thanks. I love your website and the name. I am always on the lookout for beads and bobbles wherever I go. I enjoy being "crafty" with a myriad of items, beads and jewelry being my favorite, especially since they go hand in hand. You have many wonderful treasures to sift through and I look forward to spending more time browsing. Thank you for the opportunity to win. I love the faux sea glass - beautiful!! Oh so pretty. I would love to win a chance to get some of the cool items they have over at "Stinky Dog Beads". Can't remember if I already entered :/ I would LOVE to win a gift cert for Stinky Dog Beads! I love so many of your items, especially the sea glass! I heart Stinky Dog Beads! What a fabulous selection! Thank you for the chance to win it. The beads are so beautiful. I love sea theme beads. I am blog subscriber. Would love to win!! You have very beautiful and original items, especially love the sea beads!! Love to win!!! Love the charms. Love the entire shop from the Czech beads, leather goods and of course the faux sea glass. Our shop originated from sea glass obtained from various beaches around the world. Love the shop! Purchased various kinds and colors of great leather recently, but the findings are my favorite! OOOH a new to me bead shop. Thanks for the chance to win Pearl. I love these beads and my favorite is the seahorses so beautiful. Thanks for the chance. LOVE the beads and the name! I am in love with the patina'd seahorses, and the glass ones are cool, too. I know that the gift certificate would not last too long with me. Thanks so much for an opportunity to win the gift certificate!